Authors Bodie and Gardiner will have readers on the edges of their seats as they ride the high seas into the golden age of piracy with real life 17th century adventurer Jonathan Dickinson in the new thriller “Glimpse of Sunlight,” first in a trilogy. Palm City, FL March 25, 2014—Why did Jonathan Dickinson leave Port Royal, Jamaica for Philadelphia, and more importantly, why did he leave his dazzling riches behind? His life spun out of control when he encountered Oumar Seydou and Blair Brannigan. Escape with these three unlikely adventurers and their descendants to Port Royal, Jamaica the wickedest city known to mankind in Leona DeRosa Bodie and G.E. Gardiner’s saga of passion and resistance to tyranny, Glimpse of Sunlight (ISBN: 9780989624756, WRB Publishing, 2014). 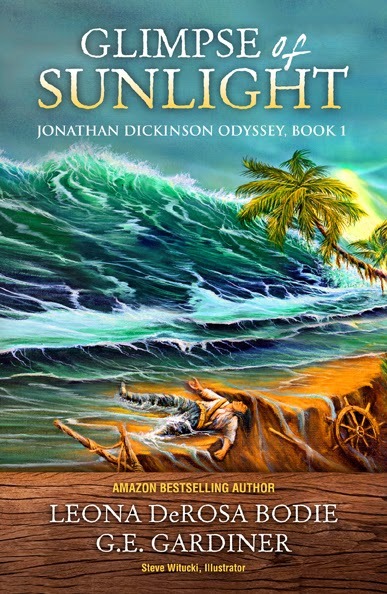 The historical thriller, “Glimpse of Sunlight: Jonathan Dickinson Odyssey Book 1,” is scheduled for release, right on time for the Centennial Celebration of the city of Stuart (Martin County on the Treasure Coast), and the 318th anniversary of Jonathan Dickinson’s shipwreck off the coast of Martin County! The authors will debut their historic thriller at the 2014 Delray Affair April 25-27, Booth AA603 located on East Atlantic Ave between 6th and 7th Avenues. Bodie and Gardiner, along with their novel illustrator Steve Witucki, are planning an art exhibit, a meet and greet, giveaways, free book swag, art renderings, etchings and prints for their launch. Witucki is also the artist for a Broadway musical premiering early 2016. He recently finished a mural for Arnold's Wildlife Rehabilitation in Lake Okeechobee, Florida. See his portfolio at www.oceans-of-art.com. Witucki’s art and the authors’ word painting capture the novel’s international landscape and memorable views. Glimpse of Sunlight stretches back to Ghana where Oumar, faced with the European invasions, made a promise to one day right the wrongs done to him and others. He soon finds himself enslaved in Jamaica with few allies and many enemies. When his, Jonathan and Blair’s pursuit of liberty and riches leads to chaos, kidnapping and murder, the question becomes…who will prevail? Can they even determine their own fate when a catastrophic earthquake and its terrible aftereffects strike? Their problem was just as daunting then as it would be for us today, since scientists can’t predict earthquakes. Authors Bodie and Gardiner weave together three separate plots that take readers from Africa to Ireland, England, and Jamaica. Their novel and the overall perseverance of the Jamaican people forever capture the power of the human spirit in this tale. Intertwined into the historical story is a complex plot of contemporary characters whose lives intersect with those of their seventeenth century ancestors. These adventures are set during the golden age of piracy and sunken treasure ships. The characters are faced with moral choices that range from revenge and violence, to murder, greed, and sensual compromise. Even a voodoo priestess, a haunted house, and a secret attic room find a place in the novel. Reviewers and fellow authors are delighted by Glimpse of Sunlight. Mackenzie Lucas, award-winning author of “To Have and To Hold,” states, “I fell in love with the characters...wonderfully compelling story.” Richard R. Blake of Reader Views says the novel is “sure to add new fans to the growing number of enthusiasts of the works of both authors.” These pirates are bound to steal your heart. Bodie, Gardiner and Witucki are available for interviews and appearances. For booking presentations, media appearances, interviews, and/or book-signings contact admin@readerviews.com. Leona DeRosa Bodie is the award-winning author of the suspense novel Shadow Cay. After teaching high school English and a stint in private industry, she decided the novel churning in her brain for fifteen years really deserved her attention. So she left her job to sail and write full-time. Leona is the Florida Writers Association’s Regional Director and past VP. G.E. Gardiner spent his first career founding and running several small businesses. In 1997, a hemorrhagic brain stem stroke put him in the hospital for 6½ weeks. 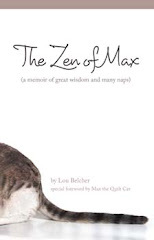 Seven years later, he began writing to strengthen his brain. G.E. also leads a Florida Writers Association group. Glimpse of Sunlight (ISBN: 9780989624756, WRB Publishing, 2014) can be purchased through local and online bookstores. For more information, visit www.JonathanDickinson.org. Publicity contact: www.ReaderViews.com.